Sorry... the 2017 Volkswagen Touareg is no longer being sold as new. The 2017 Volkswagen Touareg is a midsize SUV that seats 5 passengers. It competes with the Ford Explorer, Volvo XC90, and Nissan Murano. This year, it gains a new Wolfsburg Edition trim level, which replaces the Lux trim. Also standard now is the Driver Assistance Package. Three trims are available: the Sport w/ Technology, Wolfsburg, and Executive. The Touareg has a sleek, understated exterior with a chrome grille and rhombus shaped headlights. A unique chrome underbody trim wraps around the entire body. Standard features include Bi-xenon HID lights, LED daytime running lights, heated side mirrors, a hands-free power liftgate, a dual-pipe exhaust system, roof rails, and 18-inch alloy wheels. Available features a panoramic moonroof and unique 20- or 21-inch alloy wheels. 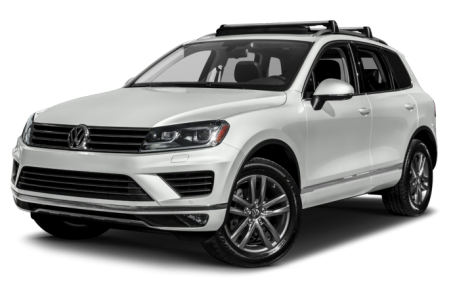 Under the hood, the Touareg is powered by a standard 280-hp, 3.6-liter V-6 engine mated to an 8-speed automatic transmission and 4motion all-wheel drive, producing 266 pounds-feet of torque. Touareg models have a maximum towing capacity of 7,716 pounds. A more fuel-efficient 240-hp, turbo-diesel 3.0-liter V-6 is also available. Fuel economy for the Touareg is an EPA-estimated 17/23 mpg city/highway. Inside, the Touareg has a modern leatherette interior with wood/chrome trim and a 60/40 split-folding rear seat that reclines. Maximum cargo capacity is 64 cubic feet with the rear seat folded down. The center stack features standard multimedia system with a 8-inch touchscreen, an integrated navigation system Bluetooth connectivity for phone and audio, and a USB port. It can upgraded with a Dynaudio premium audio system. Standard features include automatic air conditioning, heated front seats, sliding/reclining rear seat, and .ijdsf ;lsg Leather upholstery, a heated steering wheel, heated/ventilated front seats with adjustable bolsters, heated rear seats, and a power tilt/telescoping steering wheel are available as well. The Wolfburg Edition has a unique two-tone interior with Vienna leather seating, and brushed aluminum accents. The standard Driver Assistance Package comes with adaptive cruise control, forward collision warning, autonomous emergency braking, and lane keep assist are now standard. Also standard on all Touareg trims is Volkswagen’s Intelligent Crash Response System that can shut off the fuel pump, unlock doors, and switch on the hazard lights, in case the airbags deploy. The available Area View 360 camera system utilizes 4 cameras to provide an on-screen, virtual surround view of the vehicle.